Do you need more space to display your merchandise to your customers? 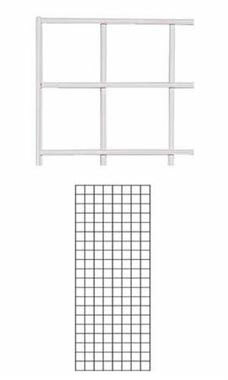 This 2' x 5' White Wire Grid Panel will create a tremendous amount of extra space on your wall. This White Grid Panel is made of sturdy wires spaced out every 3" in the center of the panel. Along the outside of the wire panel is a double wire, that provides some much needed extra strength. These panels must be ordered in orders of 2 panels. In stock and available for immediate shipment. i also have the 2 x 6 grids and these are perfect too. i placed the 2 x 5 next to the taller ones to close off our area at the shows they are elegant and the white color gives my crafts a polished professional look. Just what I expected. This will make a bare wall into a fabulous jewelry display for my shoppe.